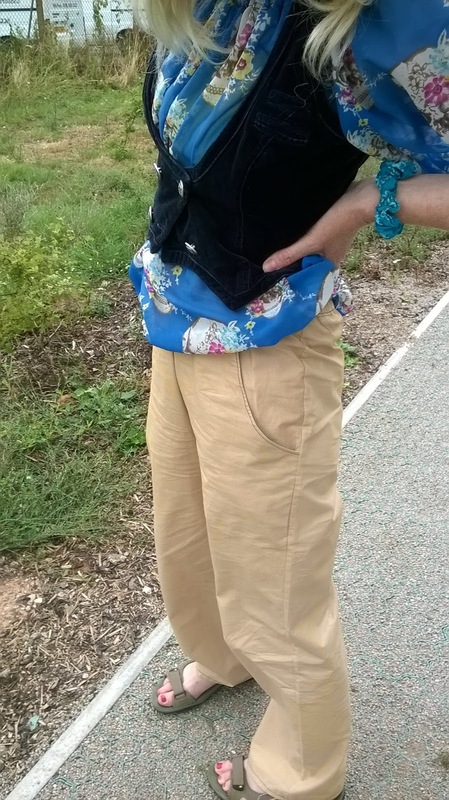 ← Sewing pants is liberating! Well I almost never got these posted in time for The Monthly Stitch July challenge despite making them over a two weeks ago. That would make the second time in two months where I have actually made something based on the TMS challenges but not posted so I have to do better. and my not very well made red sweatshirt trousers. The red ones were made right at the start of my adventures into making me – made so the finish is rubbish. They have however been very well worn and loved and they are very practical. These are not very stylish at all in this fabric and I will not be using this pattern for this sort of trousers again. 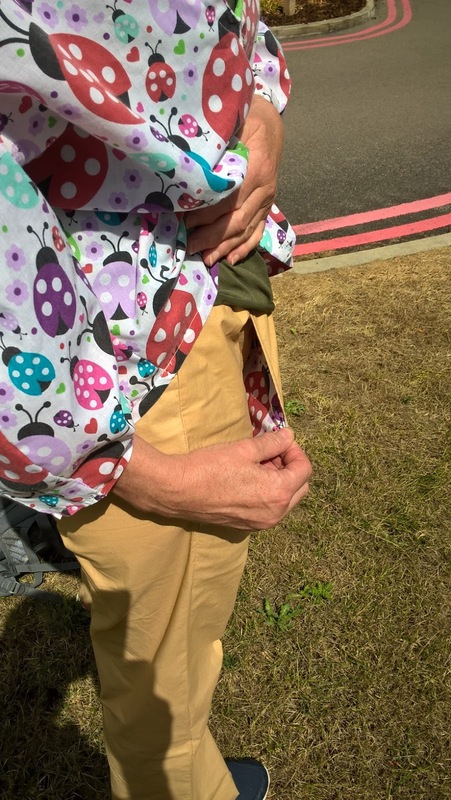 It was a fast make for some cool trousers when I was sweltering in the heat so I needed loose fit and thin fabric which they are. They work Ok and I got away with them several times over the last couple of very hot weather weeks for work wear. I do not like them at all but they do serve a purpose and have stopped me dying of heat. I will not be repeating this particular make. 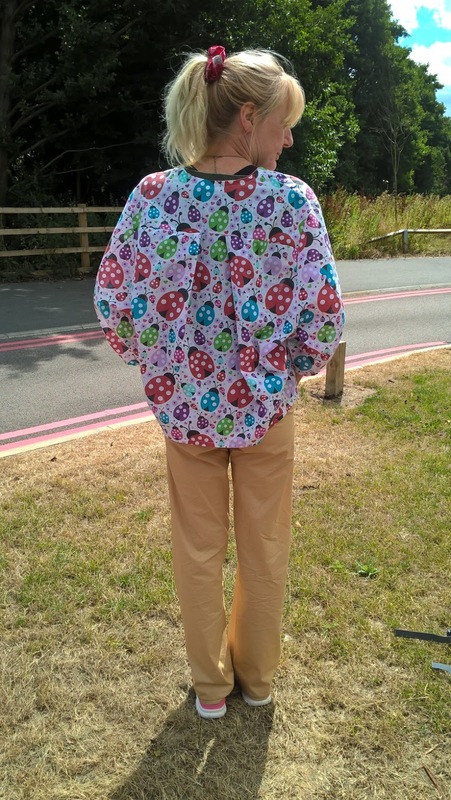 The best bit is the pocket linings which are made from the left overs of my ladybird top. 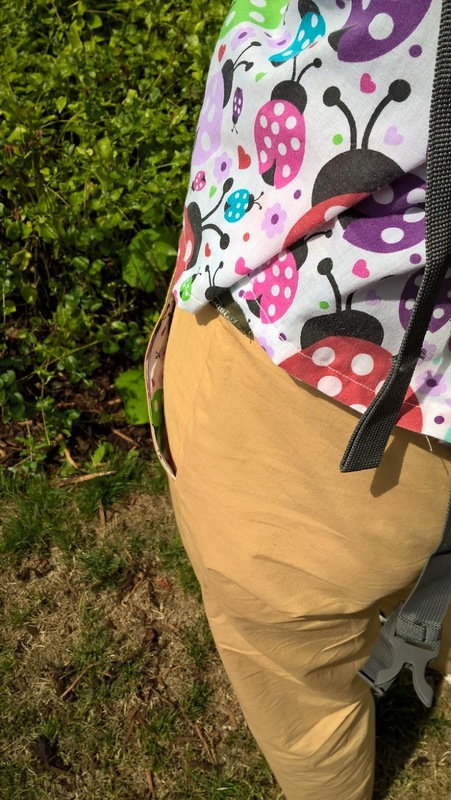 I like my pockets.The trousers fabric was sold to me as “gold” its a kind of yellowey beige so I suppose you may call it gold but really I have made some brown trousers. I hate brown as a colour. So I do not like the colour ( tho it is easy to wear work-wise) and I don’t like the style. 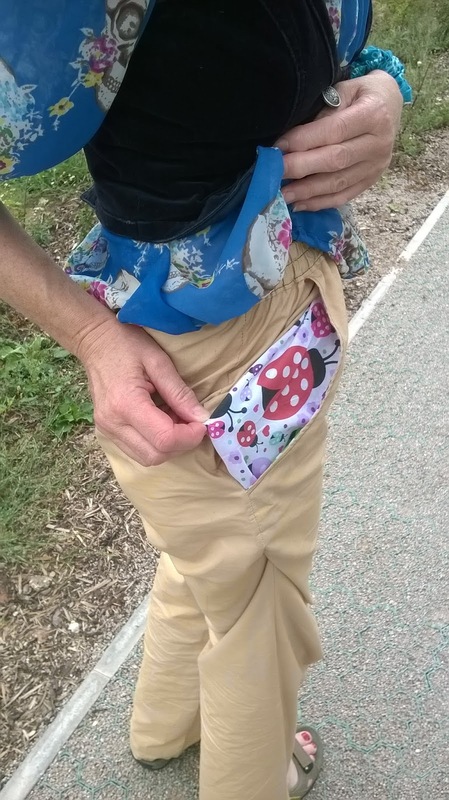 The only thing I do like about these is they dry quick when washing midweek in hot weather and I have lovely big pockets lined with ladybirds. 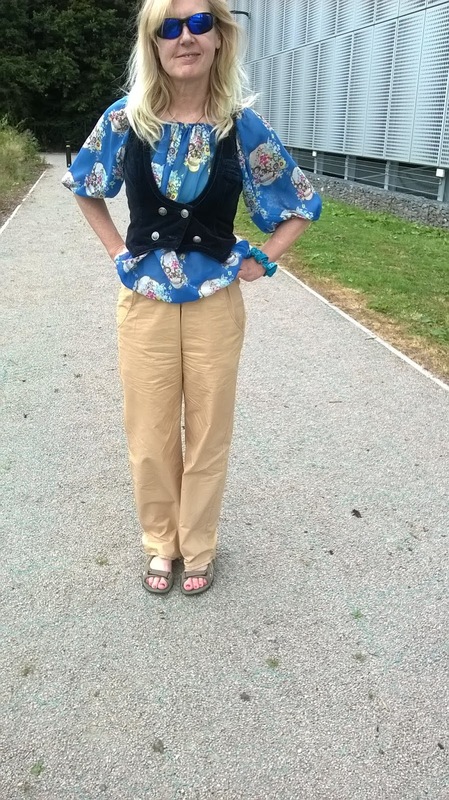 As you can see I wore my ladybird top as well. I kind of feel like this is an outfit despite it being very different fabrics and its all down to the detail of the pocket linings. 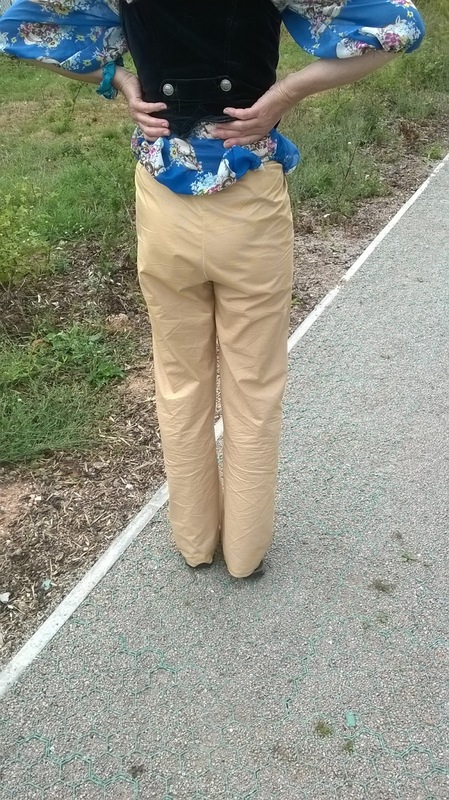 The trousers are stupidly easy to make. 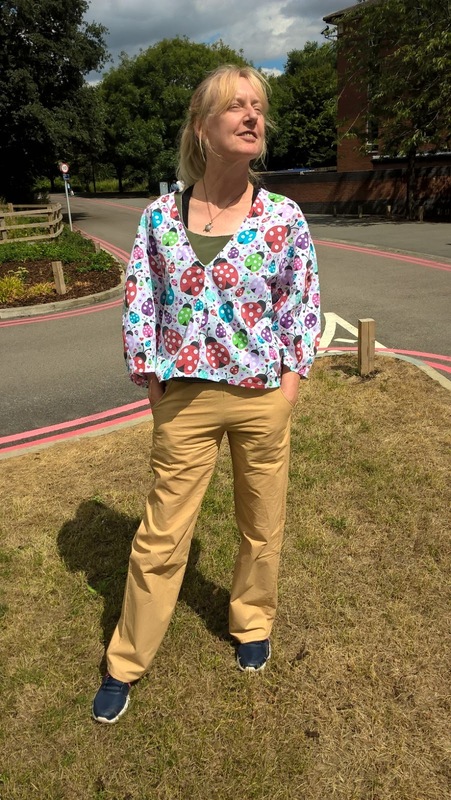 I really am not into the colour at all but in the end I had the fabric and I needed a new pair of thin trousers with the heat wave we have all just been through in the UK. Its funny a friend just went on business to India and it was 39◦C in the shade and the locals thought it cool and we only got to 35◦C in the UK I think but here that is unbelievably hot hot hot. I must admit I would rather have hot than cool but maybe not quite so hot. 28◦C is hot enough for me when I have to go to work. Certainly not my best make tho! Thank you. They have actually been a good make since it has been very hot but I would not buy this colour fabric normally.